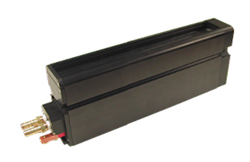 Linear High Power (LHP) Line Scan Light at greater than 5 million lux is the only scan light on the market to offer polarization. Smart Vision Lights, a leading designer and manufacturer of high-brightness LED lights for industrial applications, is pleased to introduce its Linear High Power (LHP) Line Scan Light. The new light is the world's brightest industrial line-scan light at greater than 5 million lux and the only scan light on the market to offer polarization (patent pending). Smart Vision Lights’ LHP Line Scan Light utilizes cutting-edge silicone optics and is ideal for use in applications using line-scan cameras that require high-intensity illumination such as web and print applications, packaging, electronics, and flat-panel-display inspection. This light also includes internal adjustable focus, and 700 watts of thermal energy for each foot of light. It is available in 1-ft. increments from 1 to 10 feet. For more information on the LHP Line Scan Light or other industrial and machine vision LED lighting products from Smart Vision Lights, visit SmartVisionLights.com, or contact Bobby Segraves at (231) 722-1199 or Bobby(at)SmartVisionLights(dot)com.